Our partner school, Montañita Spanish School, is located on Ecuador's famous beach of Montañita only stones away from the beach and waves. Our Spanish language school is the perfect place to learn Spanish, relax and listen to the waves break. The friendly atmosphere will make you feel at home as soon as you walk in the door. And the view of the beach right from your classroom is stunning! How to go to Montañita? To go to Montañita it is best to fly to Guayaquil. From there you can take public transport to Montañita. We recommend you to book a transfer on arrival. You will be picked up by someone directly from the airport in Guayaquil who will take you to your accommodation. (Price: see price list). The school organizes a calendar of activities and encourages students to take part and have fun. Activities include wildlife tours to Isla Del Plata, horse riding, cooking classes, surf tours, dancing, etc. The mini group course includes 4 lessons per day, 5 days per week. After an entry test on the first day you will be placed in one of the 6 different levels in groups with a maximum of 6 students per group. Classes consist of 2 lessons of grammar and 2 lessons of more conversational or activity based Spanish, to put into practice what you have learned. During the conversation/practical lessons students frequently go on trips around town to practice real world situations and even have cooking classes sometimes! Accommodation in a cabaña includes acces to a communal kitchen. It is possible to stay in a cabaña with private kitchen: the supplement for a private kitchen in a cabaña single room is € 24 per week and for a cabaña double room € 37 per week. A double room is only possible for students travelling together. It is possible to borrow the material (grammar, exercise, vocabulary and activity books) by paying a refundable deposit (approx. € 29). In 2019 the school will be closed on 01/01/2019, 19/04/2019, 01/05/2019, 24/05/2019, 11/10/2019, 06/12/2019, 25/12/2019, 30/12/2019, 31/12/2019, 01/01/2020. ** During weeks with one day of national holiday, the normal Spanish program will be provided over the four days of teaching. If two days of national holidays occur in one week, the school will offer a special three day Survival Spanish Program rather than the usual weekly program. **Please note that from time to time the Ecuadorian Government makes amendments to public holidays, sometimes at the last minute. The one-to-one course consists of 20 lessons with a complete focus on your language needs adapted to your level. This is often the best course if you are limited on time, if you have specialized Spanish to learn or just because it suits your learning style best. The Medical Spanish course has been specially designed for students and professionals in the medical field who wish to deepen their Spanish in a medical context. The language course consists of a total of 20 private lessons per week, consisting of 10 lessons of general Spanish + 10 lessons of medical Spanish. In addition, you have the unique opportunity to participate in a medical volunteer program in combination with the language course. The minimum duration for the volunteering is 4 weeks. The program gives you the unique opportunity to help where it is really needed while gaining valuable practical experience. The indicated prices include only the language course, additional fees apply for participation in a volunteer program. The Medical Spanish course is available for health professionals or students (including pre-meds). If the student also applies for a medical volunteering, the medical Spanish course has a minimum of 4 weeks. The minimum level to start medical volunteering is intermediate (B1). The Medical Spanish course combines 10 private lessons of general Spanish and 10 private lessons of medical Spanish. Students might also apply for a hands-on medical volunteering at a local hospital or clinic. Price of volunteering and transportation to internship location is not included, please contact us for details. Montañita is the home of surfing in Ecuador and known as one of the best sites anywhere in South America! The minigroup & surf course includes 20 Spanish lessons and 5 surf lessons per week. Each surf lesson takes 1.5 hour approximately. The surfing conditions are consistent throughout the year and offer the perfect waves for all levels, whether you are a beginner or a more experienced surfer. The surf course includes the board, transportation, wetsuit and instruction. Extra rental of surf board costs € 56. Explore Ecuador as you learn Spanish and experience fun and exciting adventures with the exceptional 4-week Traveling Classroom programm, designed for those with an adventurous spirit who are looking to explore both the language and places that make Ecuador such a great destination. Spend the weekdays learning Spanish (20 group lessons Spanish per week), combined with a number of interesting activities at each location. Traveling between locations occurs during the weekends. You can begin your traveling classroom adventure on one of the below mentioned starting dates in Quito. The prices of this program include the Spanish lessons, all activities, transport within the destinations, different types of accommodation depending on the destination with meals. In Quito you will be accommodated in a host family with private bedroom and half board and activities included will be trips to Mitad del Mundo (the 'center of the world'), a magnificent hot pool, the largest indigenous market in Ecuador in Otavalo, Cotopaxi National Park, and “Nariz del Diablo”- the thrilling roof top train ride at Riobamba. In Cuenca you will be accomodated in a host family with private bedroom and half board and activities included are a city tour, a salsa class, a visit to the stunning Central Bank Museum, the ruins of Pumapungo, the Inca Garden - a traditional Ecuadorian cooking class, and a visit to the archeological site of Incapirca. In Manta you will be accomodated in a host family with private bedroom and half board and activities included are a Manta area tour and an Isla de la Plata day trip where you can enjoy the rare and exotic wildlife including blue-footed boobies and nesting albatrosses. 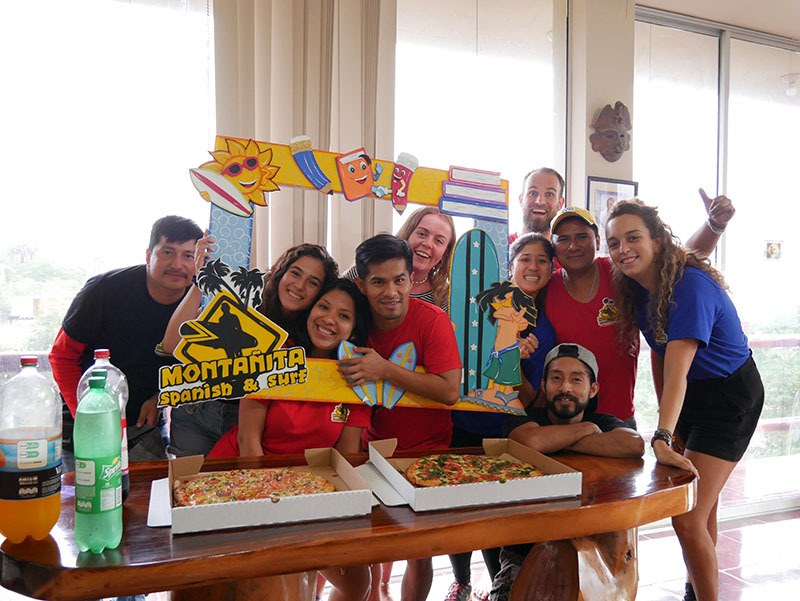 And last but not least in Montañita you will be accommodated in a shared mini-dorm and activities included will be surfing lessons, an Ecuadorian cooking class, and a surf trip to Las Tunas. What's included in the travelling classroom programme? For more information please see the PDF attached or contact us under info@studytravel.com. Das Travelling Classroom Programm findet von SONNTAG bis SONNTAG statt (am letzten Sonntag finde ebenfalls noch eine Exkursion statt). Die Nacht in Ihrer Unterkunft von Samstag auf Sonntag ist im Preis mit inbegriffen. During the Traveling Classroom program you will be accommodated in a different type of accommodation depending on the destination: during your stay in Montañita you will be accommodated in a shared dorm, in Manta, Cuenca and Quito you will stay in a single room with a local host family with half board and when staying in the Amazon, you will be staying in a dormitory with full board. From there you will spend one week in each of the 4 destinations: Quito, Amazon , Manta and Montañita. Staying with a host family offers you the opportunity to be fully immersed in Ecuadorian life. The families are very friendly but please take into account that the facilities are basic by western standard. But it is a unique experience to get to know the habits and customs of these families. Most families only speak Spanish, so it’s a great opportunity to really practice your Spanish and become integrated. Rooms are single and include half board. Montanita Eco Cabanas are located in a very nice and quiet area, are just a 3-minute walk to the school, a 2-minute walk to the beach or a 2-minute walk to the centre of Montañita. The Eco Cabanas are very spacious and fully equipped, with large beds, hammocks and fans. There is a large communal area, big kitchen, large swimming pool and Jacuzzi! These cabañas are ecologically friendly: recycled water to feed the large garden, solar outside lighting, rainwater collection for swimming pool and Jacuzzi and a recycling system – all to help the environment. All cabañas are large and include a private bathroom. For meals it is possible to use the communal kitchen. For a surcharge you can book a cabaña with private kitchen. Cabañas are available for single occupancy or shared with a friend or another independent student from school.